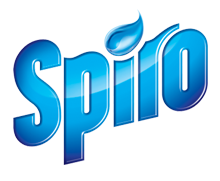 Spiro is a line of revolutionary powders and liquids which, thanks to the contribution of three enzymes, easily remove stains from protein, chocolate and blood. With the 98 percent dissolution at 30 ° C it provides one of the lowest levels of incrustation (powder remaining on the fabrics). The product works effectively at any water hardness. This prevents redeposition of dirt. 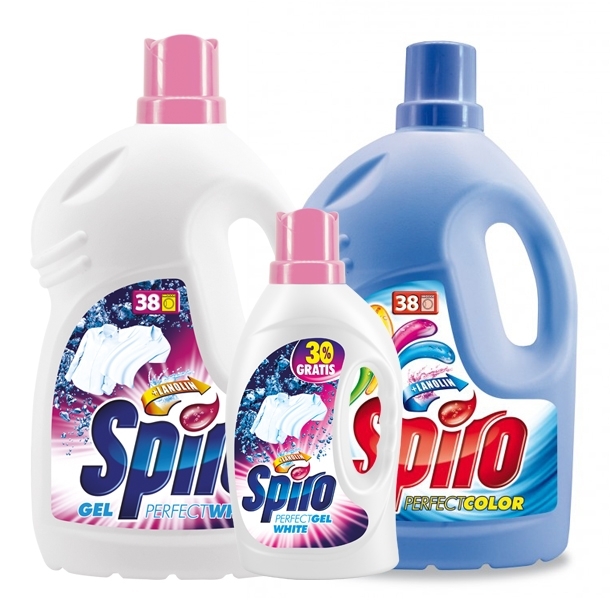 Under the Spiro brand name, gels for washing wool and delicate fabrics for black, colourful and white clothes are also produced. 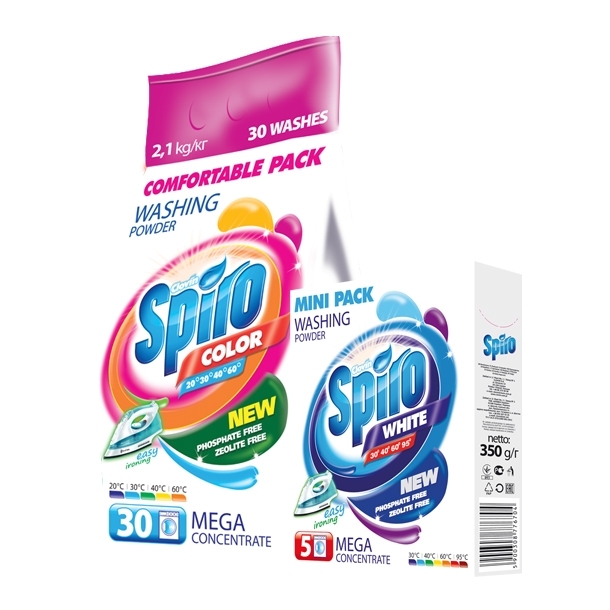 Spiro powders and liquids do not contain environmentally harmful zeolites and phosphates. Powerful powders for colorful and white fabrics. They contain supportive factors which help in removing stains, for example from carrot juice. They operate effectively at 20 ° C. With the cooperation of four components, it supports the system preventing from redeposition of dirt. The powders formula makes ironing easier. Economic and protecting the environment dosage of 70 grams. Gel for washing colorful things. Gel prevents graying and color loss, whereby the laundered fabrics look like new. Liquid lanolin contained in it, nourishes and gives fabrics softness and fluffiness. The powder works effectively even in hard water. Specially formulated gel for washing wool and delicate fabrics. The product deeply penetrates the thick fabric. 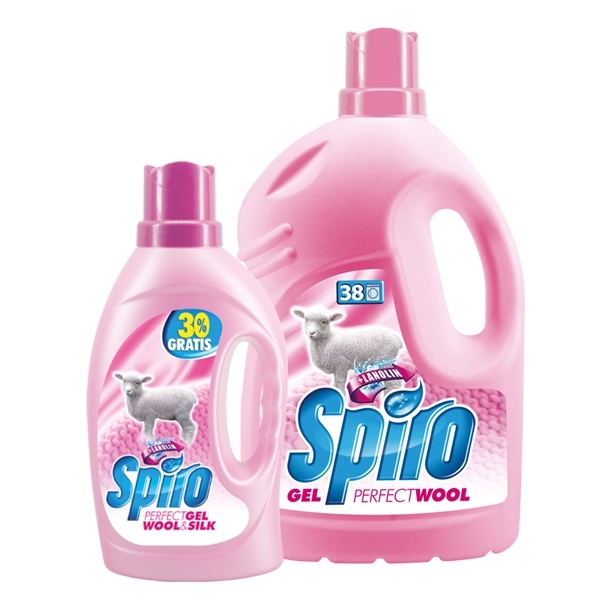 With lanolin contained in the product, it nourishes and gives fabrics softness and fluffiness. Ideal for washing wool, silk, linen, lace, underwear, tights and delicate synthetic fabrics. Gels for colorful and white fabrics with Spiro washing powders properties. 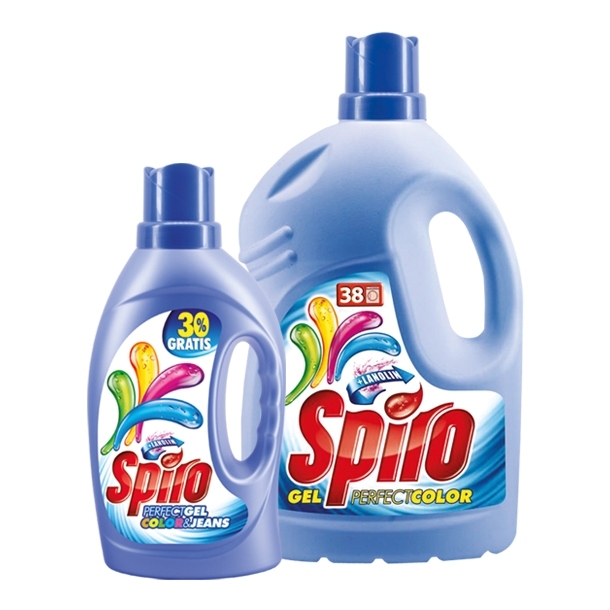 Spiro Perfect Color gel revives the colour and Spiro Perfect White Gel prevents graying of fabrics. Both gels impart softness and fluffiness to fabrics. It also works effectively in hard water. Ideal for hand washing, as well as in the washing machine.